Sure, there are guidebooks that list every restaurant and attraction in destinations around the world. But Porthole’s “Like a Local” department goes straight to the natives, who truly know the way to go. I have been living in Rio de Janeiro since 2005, but my love affair with the city started many years earlier. Born in the Netherlands to a Dutch dad and a Brazilian mom, Rio was where I spent many summer vacations visiting relatives. I always joke that even though I wasn’t born a Carioca, I was certainly born to be one! I love Rio’s bustling energy, and I have to admit that the weather helps too: humid tropical summers and winters that rarely dip below 65 degrees. I feel right at home in this glorious city wedged between the ocean and lush green mountains where locals still take time to spend the afternoon on the beach, grab a cold beer after work, meet friends for a casual barbecue, or listen to live samba music any old day of the week. Although every city has its tourist traps, Rio de Janeiro’s top attractions really are worth the visit. By all means take the train to the top of Corcovado Mountain and admire the city laid out at the feet of Christ the Redeemer, top off your tan at Ipanema beach, and watch the sunset from Sugarloaf hill. Just don’t leave it at that! Take a few hours to visit Flamengo Park and enjoy the gorgeous views of Guanabara Bay from Flamengo Beach. Skip the more formal Botanical Garden and visit the Parque Lage almost next door. This free park at the foot of the Tijuca Forest features lush Mata Atlantica and a delightful café and art school where students display their work. Also make time to stroll the narrow cobblestoned streets of downtown Rio, especially around Praça XV and Cinelandia where you’ll find many historic gems ranging from baroque 18th-century churches to an elegant neo-classic theater, library, and fine arts museum. For a city of 6 million people, Rio de Janeiro boasts a surprising number of quiet nooks where you can easily escape the crowds. Just a 10-minute cab ride from Rio’s port lies the hillside bohemian neighborhood of Santa Teresa. Enjoy a walk through the neighborhood’s quiet cobblestone streets, visit some of the small art museums, or visit the many artists who have set up studios in Santa Teresa’s elegant mansions and quaint houses. The best free attraction in Rio de Janeiro is the beach. This is where locals and tourists mingle and where everybody is welcome. You have plenty of choice: Praia Vermelha, at the foot of Sugarloaf Mountain, is a small beach with almost no waves, perfect for young children; Copacabana and Ipanema are a microcosm of the city. Upscale Leblon is popular with local celebrities and great for spotting supermodels on their days off. Further west, Barra da Tijuca and Recreio feature miles and miles of uninterrupted strand, a haven for surfers and kite-surfers. Cariocas love light colorful summer fashions. So leave those big bulky backpacks, baggy tracksuits, and white T-shirts at home and don’t be afraid to flash a bit of color and skin. This is an excerpt only. 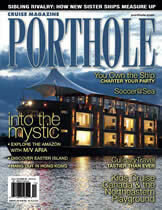 To read this article in its entirety, pick up the current issue of Porthole Cruise Magazine.